COLOGNE, 2 APRIL, 2014 — RTW, a leading vendor of visual audio meters and monitoring devices for professional broadcast, production, post production and quality control, is pleased to announce the debut of its Masterclass PlugIns range at the 2014 NAB Show (C1246). The new software provides the company’s renowned metering tools as standard-format plug-ins for Windows and Mac OS platforms. The RTW Loudness Tools, scheduled for availability in May, will be the first of the company’s monitoring products available as part of the new range. This will allow a larger number of RTW customers to access its award-winning metering tools. Each RTW Loudness Tools Masterclass PlugIn visually depicts audio with all relevant level and loudness values as specified by international standards. It conforms to the EBU R128 loudness standard, as well as SPL, ITU-R BS.1770-3/1771-1, ATSC A/85, ARIB, and custom (to set OP-59, AGCOM), making it ideal for audio and video engineers, radio producers and musicians, who are required by TV and radio broadcasters to conform to the standard. It is also a handy tool for quality control, offering the precision and ease of use required to ensure compliance with custom specifications. Operation of the plug-in is highly intuitive, so that even users without a great deal of experience in monitoring loudness can use it effectively. The RTW Loudness Tools support all standard sampling rates up to 96 kHz and offer plug-in operation in mono, stereo and surround formats (eight channels maximum). The plug-in includes RTW’s Peak Program Meter, TruePeak, and Spot Correlator instruments and also offers all common loudness formats plus MagicLRA and an SPL view. The user interface of the plug-in is based on the award-winning RTW TouchMonitor TM7 and TM9 units, and offers the same degree of functionality and clarity as the hardware models. The instruments provide graphical/numerical, as well as bargraph views, and can be freely rearranged and scaled. Various function parameters, such as integration time, operational range and tolerance, along with a number of viewing options for metering data and scales, offer extra flexibility. The plug-in window dimensions can be set to the native resolution of RTW TouchMonitor display screens, including 480x272, 800x480, 1024x800 (landscape view) or 272x480, 480x800, 800x1024 (portrait view). Users can store all setups and layouts as presets in their DAWs. 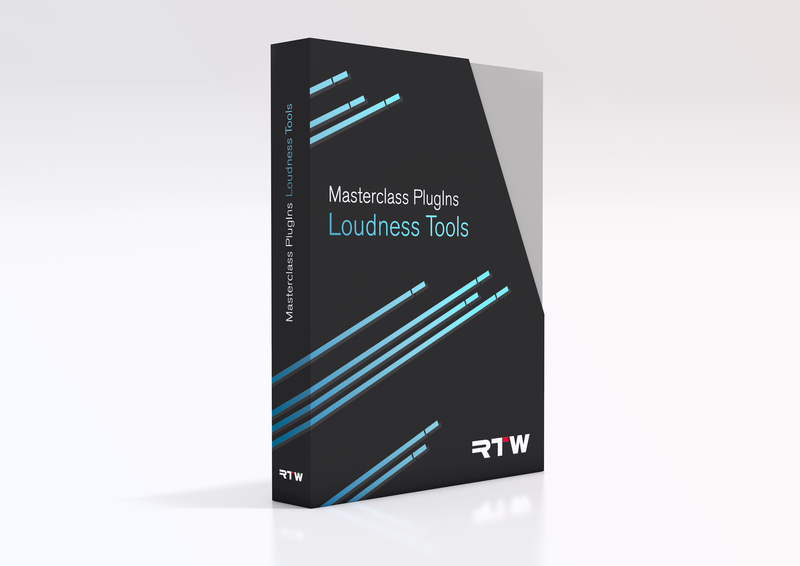 The RTW Loudness Tools Masterclass PlugIns require Windows 7/8 (32-bit or 64-bit) or Mac OS 10.6 or higher. RTW will first make them available in the VST 2.4 format for Windows systems and the RTAS format for Mac OS. VST, RTAS and native AAX64 support on the two platforms will follow. PACE anti-piracy and iLok USB copy-protection dongle are used for handling license management and plug-in activation. On an authorized computer, users can use unlimited RTW Loudness Tools instances. RTW, based in Cologne (Germany), has more than 45 years of experience in designing, producing, and marketing advanced recording-studio systems. The company focuses its business on professional audio signal metering tools that are in use in the leading recording studios as well as by radio and TV broadcasters worldwide. The current product portfolio highlights the TouchMonitor range, a new series of tools for visual signal analysis and comprehensive loudness metering. The TouchMonitor combines the highest of flexibility and modularity with an intuitive user interface and touchscreen-based multichannel-analysis features, integrating exceptional surround-signal visualization using the unique and groundbreaking Surround Sound Analyzer. The high-end SurroundControl series of products with fully fledged loudness measuring combines the convenient metering options of the RTW surround display devices and the control functions of an eight-channel monitoring controller.